After an amazing week exploring the temples of Chiang Rai, I took the Green bus to Chiang Mai. To get the Chiang Rai to Chiang Mai bus, the best thing to do is to download the Green Bus App and book your ticket on there. I could use my American Express Credit card for payment, and the cost wasn’t more than a few pounds! So I had 5 days to scope out the best Chiang Mai temples, and they are literally everywhere you look! 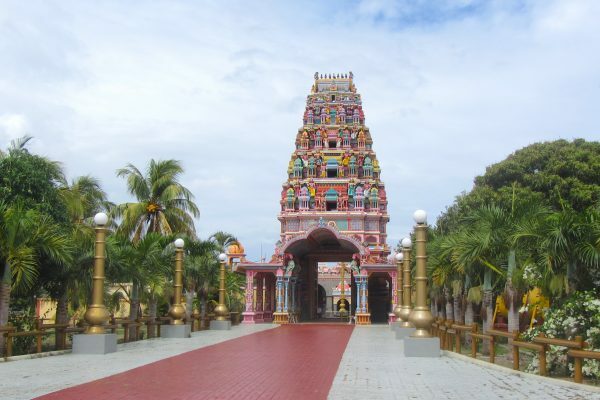 Oh, and by the way, I’m currently on a travel challenge – 30 temples in 30 days. I did 14 temples in a week in Chiang Rai. After a few more days in Chiang Mai, I lost count! I think it’s safe to say that I completed the challenge, as Chiang Mai was followed by Sukhothai and Ayutthaya where I was clocking up over 10 temples daily! Wat Intakhin was the smallest and cutest of the Chiang Mai temples I visited. This petite but noticeable little temple in the centre of the old town of Chiang Mai is worth a visit for the small scale beauty and pottery Buddhas representing see no evil, speak no evil, hear no evil. Wat Inthakin also has some pretty cool Yakshas (guardian giants) and lovely Buddha statues that you can see inside the temple. #Yakshas are my favourite benevolent beings found at #Thai #Temples. 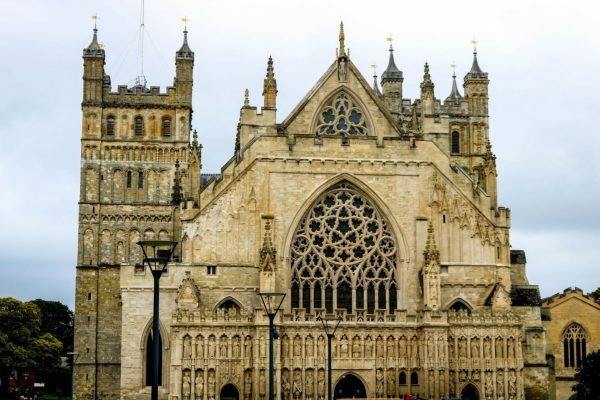 These guardian giants protect and ward off evil spirits. Here’s one I found at #WatInthakin in #ChiangMai. 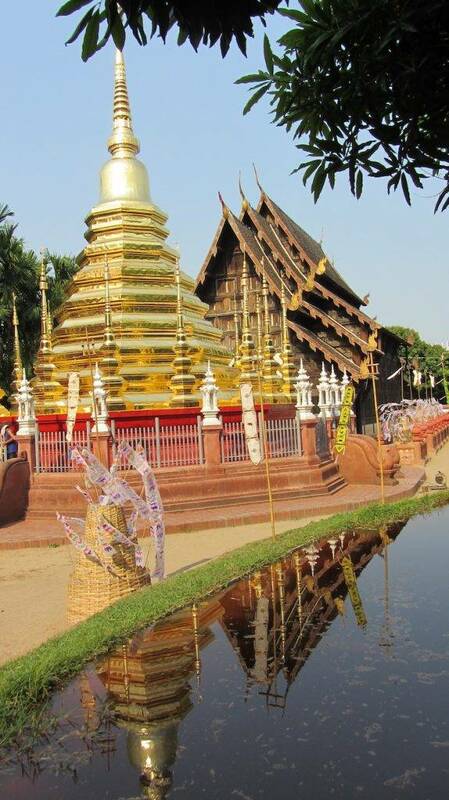 Located next door to Wat Chedi Luang in the heart of the old city is the beautiful wooden structure of Wat Phan Tao. The teak prayer hall houses a golden Buddha, with several smaller Buddha statues and donation bowls on either side. The teak prayer hall houses a golden Buddha and is surrounded by beautiful gardens and a pool that reflects the temple and golden Chedi in the sunlight. Temple dogs are often lazing around in the garden basking in the sun! 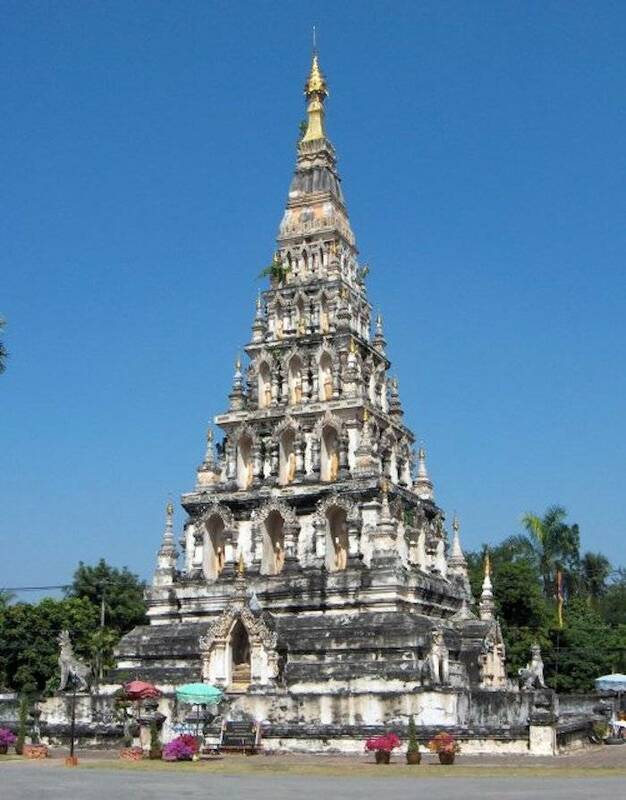 Wat Chedi Liam (Wat Ku Kham), located in the old town, is often referred to as the temple of the square Pagoda. 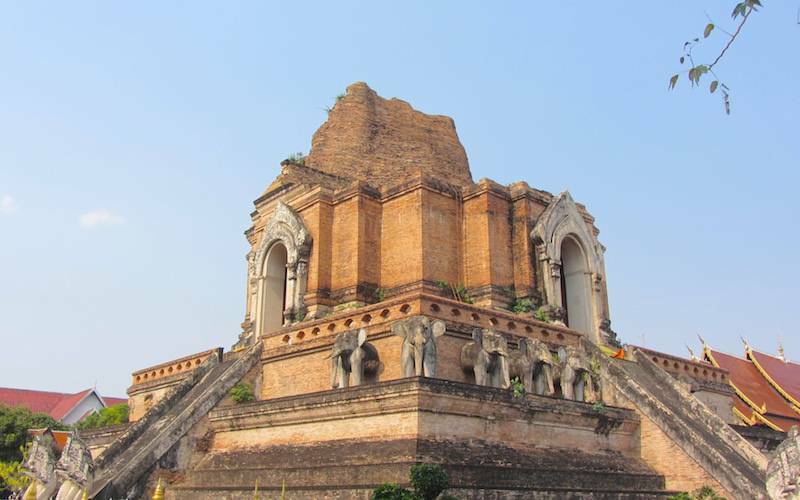 It was built in the 13th Century in Wiang Kum Kam, ancient capital of the Lanna empire. The stepped square Chedi is the focal point of this temple, but it also has a beautiful Ubusot (prayer hall). Wat Chiang Man is home to Phra Setagamami – the 1800 year old Crystal Buddha and Phar Sila – the 2500 year old Marble Buddha. This was the first temple I visited in Chiang Mai and a great introduction to the amazing Chiang Mai temples. Both Buddha statues have been in Wat Chiang Man since it was founded in the 13th Century AD. They date back to the founding of the City of Chiang Mai by King Mengrai the Great (1239-1317), the first King of the Mengrai Dynasty. Wat Phra Singha is located at the end of the main street and (Rachadamnoen road) of Chiang Mai and the temple entrance is guarded by Singhas (lions). I was lucky enough to see the Songkran Buddha procession start from Wat Phra Singha. It is one of the most important events of the Thai Buddhist year and Wat Phra Singha houses Phra Buddha Sihing, the important Buddha that gets paraded round the city every year. Wat Chedi Luang was possibly my favourite temple in Chiang Mai, due to the well preserved Elephant and Naga statues on the main Chedi that dates back to 1441. 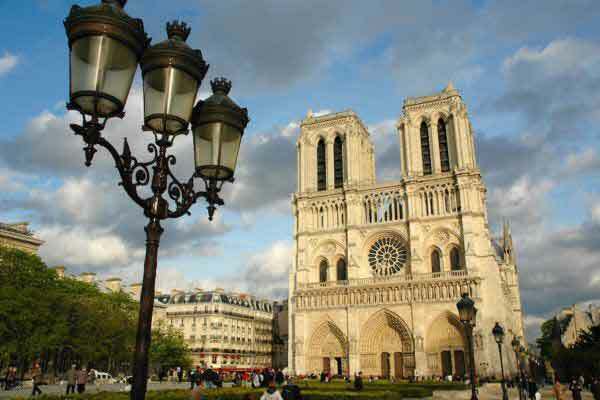 It’s located in the centre of the old town on King Prajadhipok Phra Singh road. 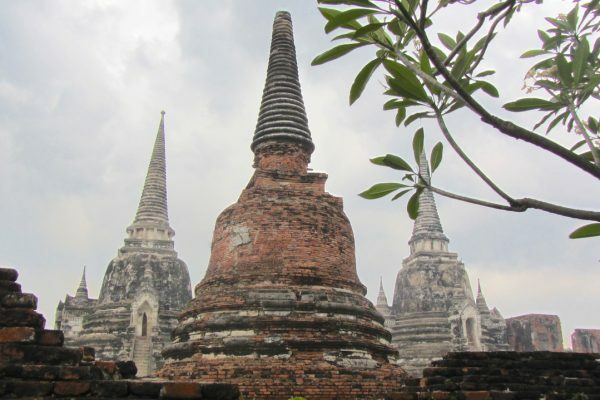 The current temple grounds were originally made up of three temples — Wat Chedi Luang, Wat Ho Tham and Wat Sukmin. At the base of all four main Chedi stairs you will find a shrine with a golden Buddha, all of them unique in their own way. You can also see statues of the past Thai Kings at the back of the main Ubusot. In addition to the main Chedi, there are several other modern mini stupas, displaying beautiful golden Buddhas. Make sure that you fully explore this extensive complex. The prayer halls are guarded by some stunning nagas (mythical dragon or snake like beings that are temple guardians). Also on the grounds of this temple complex, you will find the Chiang Mai city pillar, marking the centre of Chiang Mai and celebrated in an annual festival. Behind the Chedi itself you will find further temples and shrines containing a sleeping Buddha and a Happy Buddha. Oh and don’t forget to donate to feed the Chiang Mai temples dogs! The most beautiful of the Chiang Mai temples is slightly out of the city itself, but well worth a visit – in fact, it’s a must. Take a Songthew to the Zoo and another to Wat Doi Suthep and it won’t cost you more than around 80 baht. You will climb a lot of stairs – be careful not to slip like I did! 😉 Once you get to the top of the Naga stairs, there is a 50 baht entrance fee for foreign nationals. Wat Doi Suthep is one of the most sacred temples in Thai Buddhism and holds a relic of the Buddha (a strand of hair) in its Chedi, built on the place where the Kings elephant, who carried a strand of hair of the Buddha, laid to rest. I’ve written a whole blog and done an Instagram walk of Wat Doi Suthep – read it here. As well as the Chiang Mai temples, there are many other things to do in Chiang Mai, so stay a little longer to check out the night market and the Elephant Nature Park. 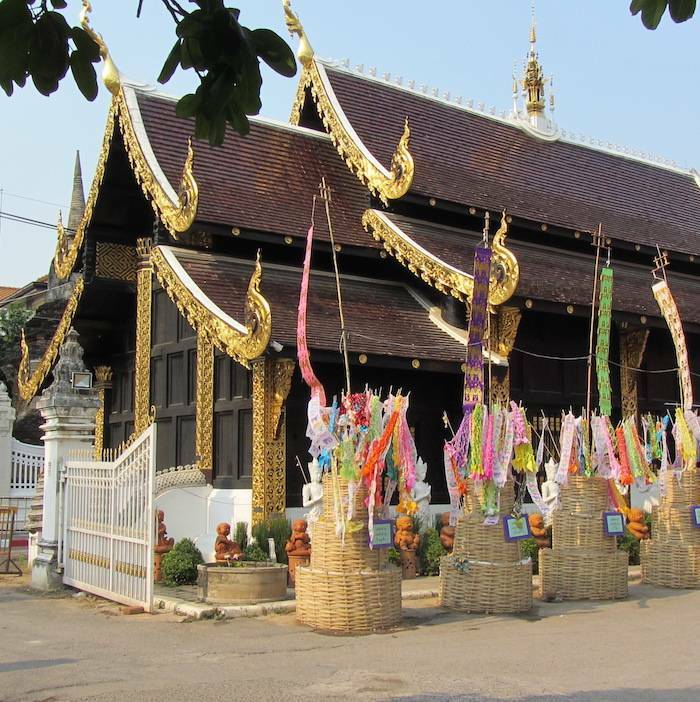 If you are visiting the Chiang Mai temples, you are best staying within or near the old city walls. However, transport is cheap if you decide to stay a little further out for more tranquility. All the hotels that I recommend in Chiang Mai are within walking distance of Chedi Luang and include free WIFI and breakfast – all the essentials! 😉 iWuyai Hotel – 3* Hotel 1.2m from city centre. 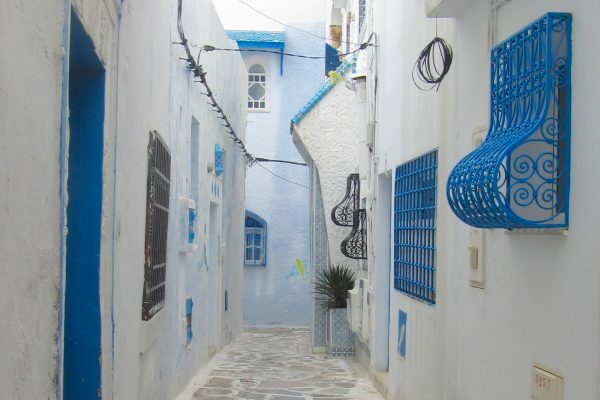 Wing Bed – 3* Hotel 900m from city centre.